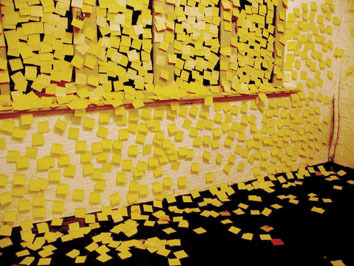 [Below:] A Message to You (2005) post-it note installation, dimensions variable. 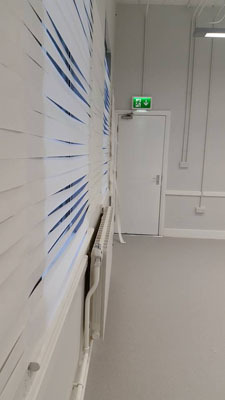 Exhibited at Cumbria Institute of the Arts, Carlisle. [Below:] Untitled (self-portrait) (2006) whitewash installation, dimensions variable. 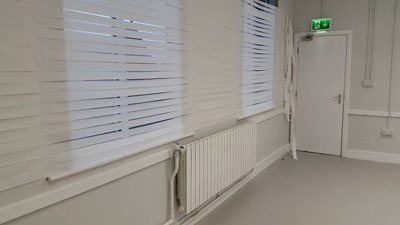 Exhibited at Fold Gallery, Kirkby Stephen. 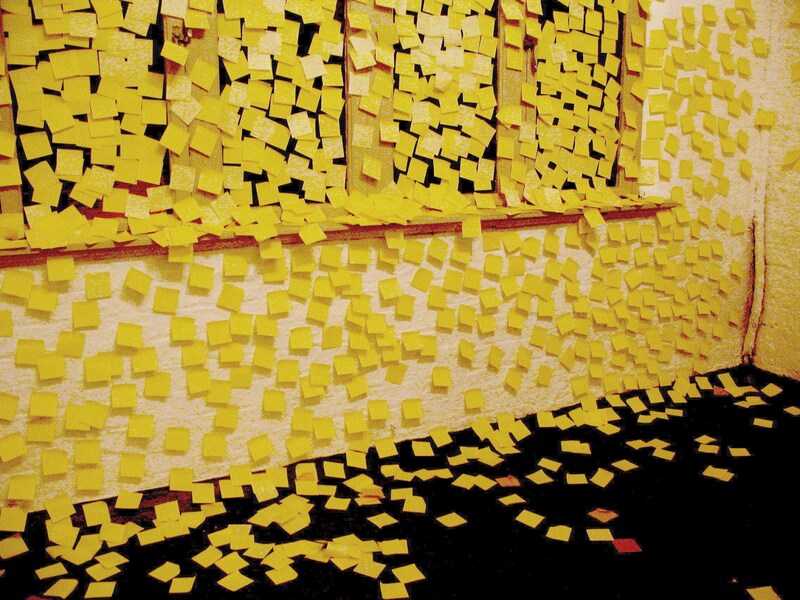 [Below:] A Message to You (2006) post-it note installation, dimensions variable. 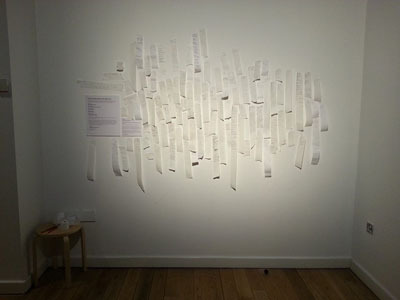 Exhibited at Red Wire Gallery, Liverpool. 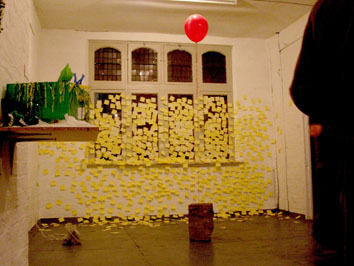 As part of Liverpool Biennale Independents 2006. 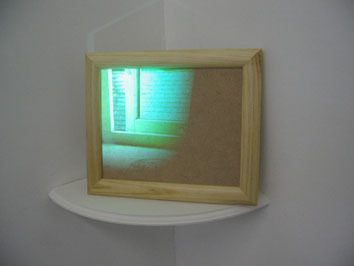 [Below:] Untitled (window) (2006) video installation, dimensions variable. 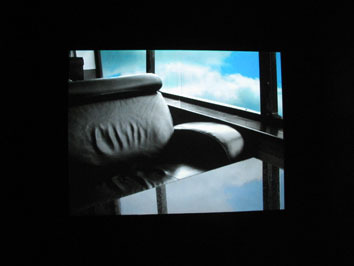 [Below:] Haven (2006) video installation, dimensions variable. 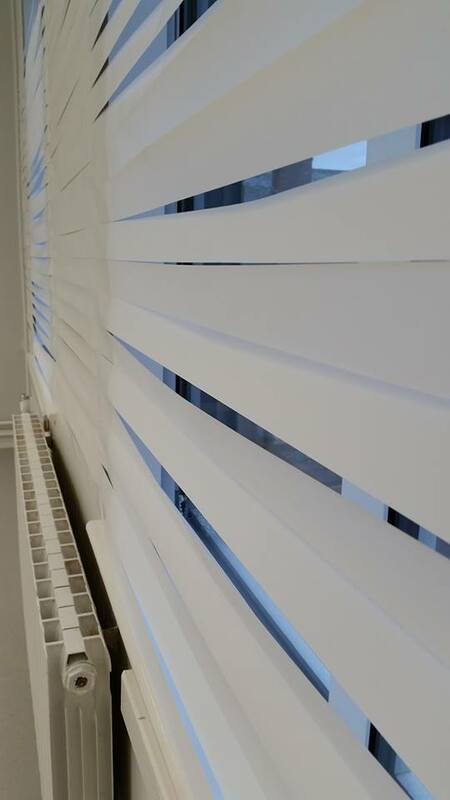 Described by viewers as being, "minimal yet poetic". 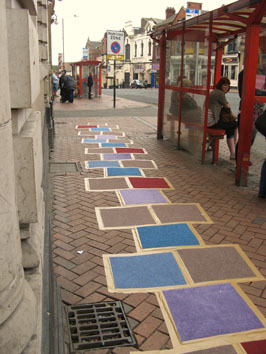 [Below:] Public Art Intervention #1: "Hopscotch!" 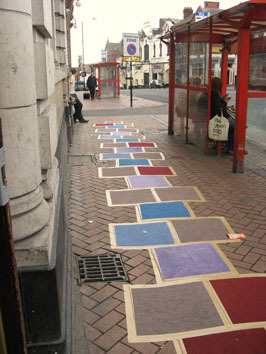 (2007) carpet squares and duct tape installation, 86m x 1m. On 6th-9th September 2007. At Paternoster Row/Castle Street, Carlisle. 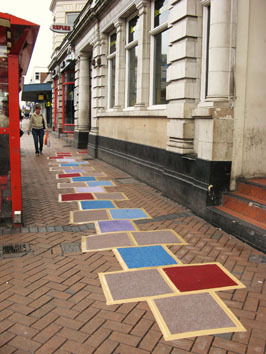 This was featured in News and Star newspaper, Lookaround Border News and on BBC Radio Cumbria too. It was the talking point of the city at the time and locals wondered where it had appeared from and why. There was even speculation that it was an advertising stunt. The original piece was actually created and installed some months earlier but was removed by disposal men, who mistook it as litter! 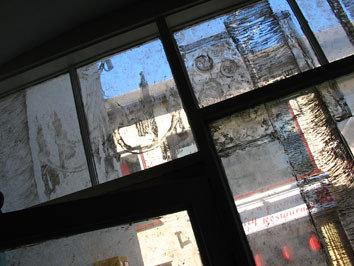 The artwork was very well received in the end and the locals mostly engaged positively with the artwork. I enjoyed observing people interact with the piece whilst it was there. Some said it evoked of memories of childhood - a carefree, colourful, happy-go-lucky and safe existence. 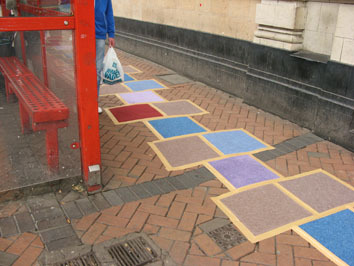 Others saw it as a feat of endurance - to hopscotch from the start all the way down to the last tile. 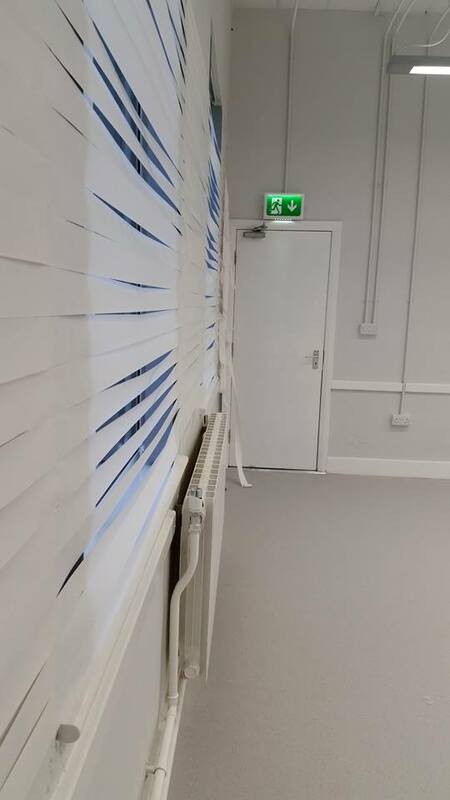 Just one gentleman called it "vandalism". At this point in time, this was my largest artwork to date! I'm not certainly not afraid to be ambitious and think BIG! 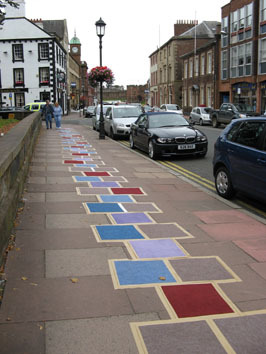 [Below:] "Hopscotch! 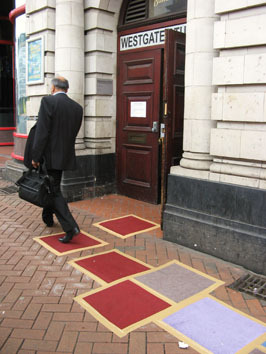 #2: Wakefield" (2011) carpet squares and duct tape installation, approx 10m x 1m long. On 25th May 2011. 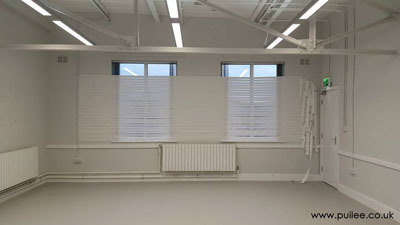 As part of Temporary Art Show 3: Part 2 (2011) At Westgate Studios, Wakefield. 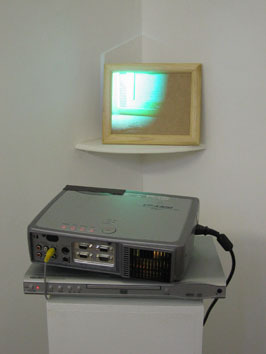 This piece allowed me to explore ideas of site specificity and viewer interaction on new territory. 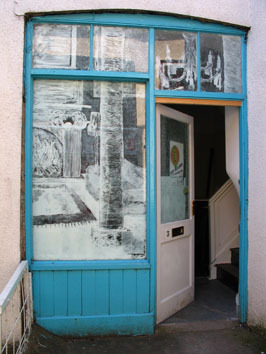 The artwork acted as an appropriate entrance to the exhibition and studios. 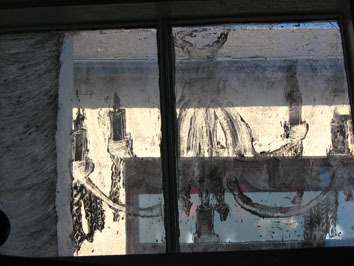 It helped to draw in new visitors as well as provoking people to ask questions about what it was and why it was there. Reactions included: curious looks, complete ambivalence, many avoiding to walk over the piece (carefully tiptoeing to the side), a few playful games of hopscotch... and even the Highland Fling was performed on it! 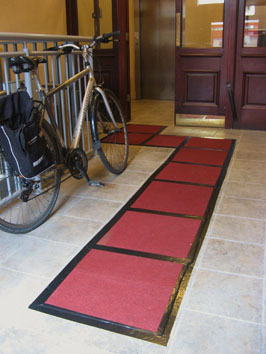 [Below:] "Red Carpet: Wakefield" (2011) carpet squares and duct tape installation, dimensions variable. 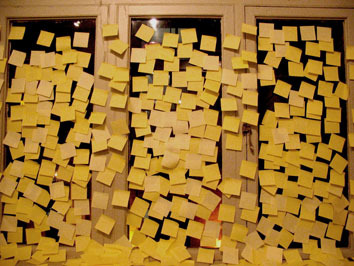 On 25th May 2011. 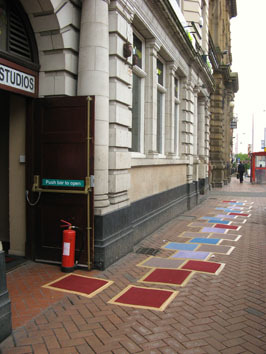 As part of Temporary Art Show 3: Part 2 (2011) At Westgate Studios, Wakefield. 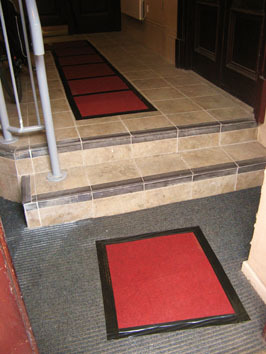 Installed at entrance foyer. 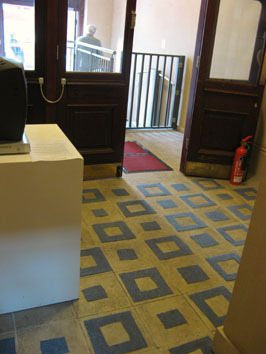 The artwork made reference to the idea of game in terms of popular pixelated arcade games like Snake, whilst suggesting the importance of the exhibition viewer in relation to an art show. 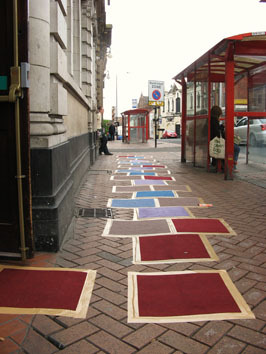 [Below:] "Untitled" (2011) carpet installation, dimensions variable. On 25th May 2011. 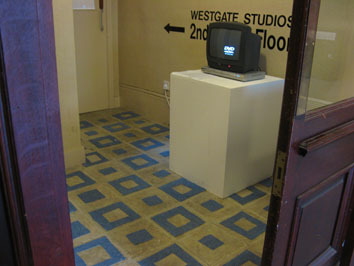 As part of Temporary Art Show 3: Part 2 (2011) At Westgate Studios, Wakefield. 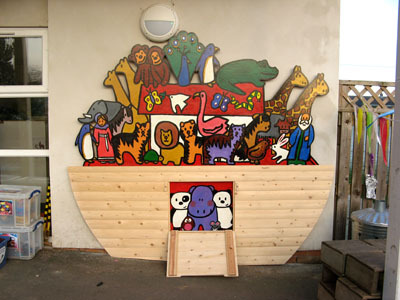 [Below:] "Noah's Ark" (2012); MDF, acrylic, varnish. Installed at High Heskett C of E Primary School, Cumbria. 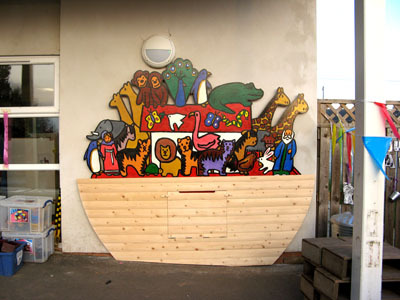 The brief was to create a piece based on the theme of Noah's Ark, which would brighten up an infant play area at the school. I came up with various designs for the piece and painted the characters with vivid bright colours, which would put a smile onto any face! 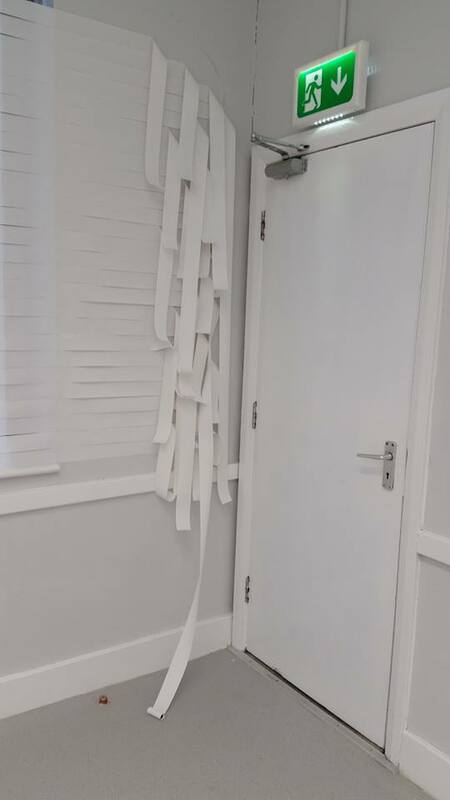 School staff were pleased with the outcome. Thanks also to Chris Debinson from W.M. 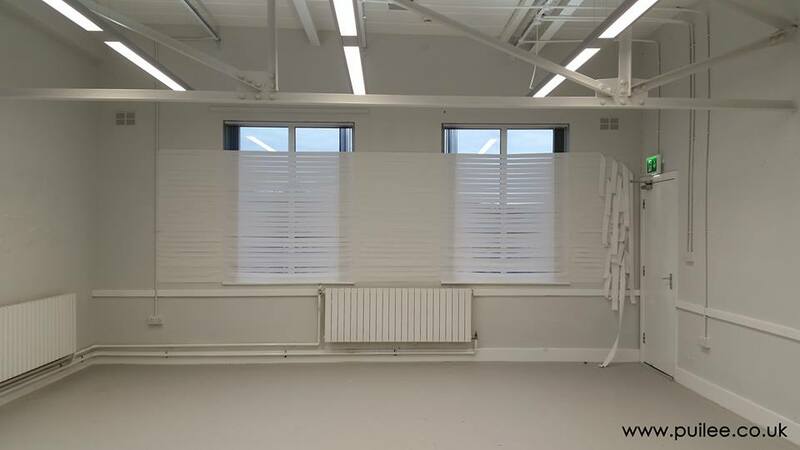 Joinery, Carlisle, and assistance with the cutting, construction and installation side of things; thus, helping me to realise my vision for the piece. -Your kindness and support has been invaluable! Exploring ideas of wealth and value, this installation was made in response to the themes of the "Show Me the Money!" 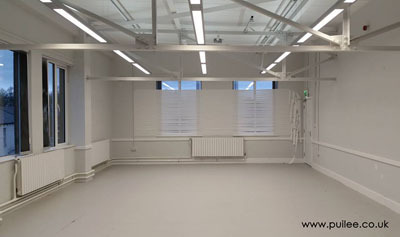 touring exhibition at The People's History Museum, Manchester, and was on display in the Learning & Access space in the show from 29th July 2015 to the end of 2015. For this participatory piece, visitors were invited to think about the following question and to write down their responses onto a piece of till receipt, which was then attached onto the wall: "If you had all the money in the world, what would you do with it/spend it on?" Taking nearly five hours to install, this piece is made entirely out of till receipt paper and was made in response to the space in the Parquet Room as part of the West Walls artists group show at "Old Fire Station" arts centre, Carlisle, in December 2015. 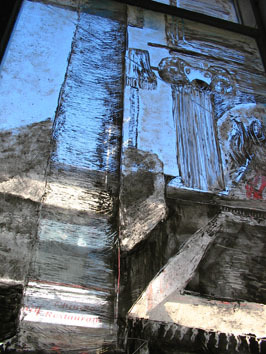 For me, the artwork is successful on both a conceptual and aesthetic level so I am happy with that! 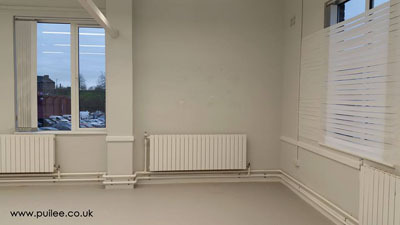 Unfortunately, Carlisle then suffered major floods after Storm Desmond wreaked havoc across the northern part of the UK and the exhibition only lasted one day past the opening evening.